After accidentally heading to High Park for the cherry blossoms, I became dedicated to the idea of returning for a Torottawalk. The park is huge, and I’m hoping to see High Park’s Grenadier Pond – a one-of-a-kind geological feature and tell the perplexing story of how it got it’s name. But how did we get High Park in the first place? 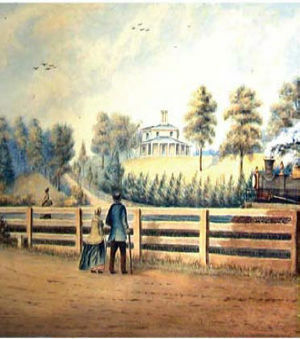 John and Jemima Howard purchased a lakeside stretch of land – from Lake Shore Road to Bloor Street – in 1836, four years after immigrating to York (Toronto) from England. They called the property High Park because of the height of the hill overlooking Humber Bay and Lake Ontario. In 1873 the Howards gave their country property to the City of Toronto to be maintained as public parkland, over the next 3 years, the city took over 120 of the Howards’ 165 acre estate – all but Colburn Lodge, essentially. The Howards retained ownership of Colborne Lodge and the surrounding 45 acres until John’s death in 1890. Colborne Lodge – their home – is now open to the public as a historic house museum containing many of the Howards’ original belongings. As avid gardeners, the Howards filled their land with gardens – in John Howard’s 1883 diary he recorded that he had counted 10,993 spring bulbs in bloom- and had farmed and rented portions of the land to tenant farmers. Since that time The City Parks Department has initiated study after study to rehabilitate and maintain High Park and the unique ecological factors; defining transportation and traffic flow, safety and recreation, the natural environment and virtually all aspects of park use, development and maintenance and has since been declared an Area of Natural and Scientific Interest (ANSI).